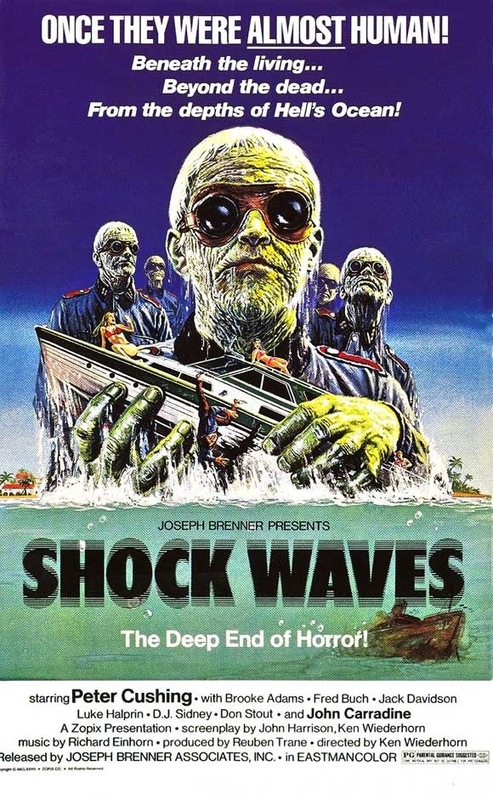 What It’s About: A small boat crashes into a wreck up off the coast of a remote island that harbors a bizarre remnant of the Nazi military — zombies! In most respects it’s an awful movie, but two things can make it worthwhile to some viewers. First is Peter Cushing’s role as the German officer watching over the undead soldiers. Always the trooper, he does his best in the few scenes he’s given. The other great thing about the movie is the zombies. There’s some good underwater footage, and the scenes of corpses rising from the water are so excellent that they’re shown repeatedly. Why Watch It Today? : By signing a bill that took effect on this date in 1951, President Truman officially ended the United States’ state of war with Germany. Someone forgot to tell the Nazi underwater zombie unit. This entry was posted in Based on a Comic Book, Horror, Movie of the Day, So-Bad-It's-Bad, Uninvited Guests, Zombies and tagged island, John Carradine, Nazis, Peter Cushing, vacation. Oh, yeah… THIS movie, heh. I didn’t see this one in a theater, but caught it later chopped to bits on network TV, then on tape later a few too many times. Yup, it’s not so good other than Cushing slumming so well and those creepy underwater sequences. I’d watch it on a double feature with The Keep just to have at least a decent-looking second part of that bill. I didn’t much care for that film either, but at least it’s much better made and still fun to watch.